R. Escalante & F. Pacheco a Building block model. R. Escalante & F. Pacheco. 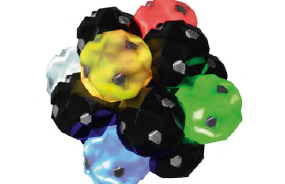 An optimized design of a ball cover. R. Escalante & F. Pacheco. Un Modelo Matemático para La Bola de Fútbol. We study the sphere as a geometrical figure and we sell products that take advantage of its unique symmetrical structure. The Physics of a Curve Shot. The Magnus effect phenomenon creates a whirlpool of air around a spinning ball and this behavior is reponsible for the curved motion of free kick shots in soccer. It takes a lot of skill from a player to curve a shot.